Sew Inspired: It's Giveaway Day!! Hi friends! Today I have a couple things to give away to one lucky person! First is this little Christmas mini-quilt. I'd say it's maybe 8" x 10". The shapes are machine-sketch-appliqued to the quilt through all 3 layers, using my free-motion foot. 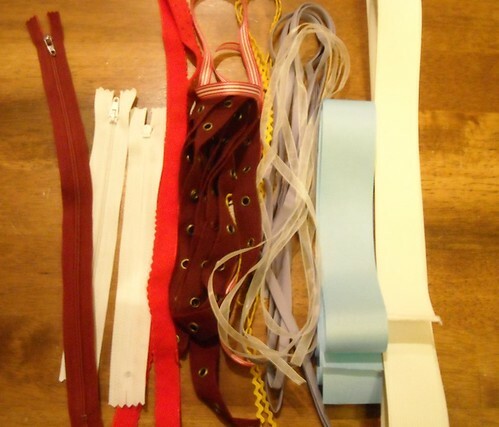 Here's what's in the pile: 3 zippers, red elastic, weird little eyelet tape, mini yellow ric rac, lavender bias tape (over 2 yards, I think), sheer white ribbon, almost a yard of striped red ribbon, some wide blue ribbon, and a couple yards of 1.25" wide elastic. All you need to do to win is make a comment, but it has to be something interesting, not just "I want to win." You can tell me about a cool gift you've received, what you're making this month, a joke, something funny your kid did, whatever. The winner will be chosen randomly. Please make sure I have a way to get a hold of you. If your email address isn't available in your blogger profile, include it in your comment. If I can't contact the winner I'll choose another one! The giveaway will be open until December 17. Also, you know about Giveaway Day, don't you? Head on over to Sew, Mama, Sew for links to lots of giveaways, all starting today! I am making a picnic blanket quilt. Ita a checkerboard for playing after you picnic. It's a gift and not near done! Thanks for the kind giveaway. Your mini-quilt is so sweet. I have a funny comment from my kids (ages 13 and 14). The older one was trying to explain the different properties of the chemical elements. The older daughter explained "this element is sort of like me, it is repelled by other elements and doesn't want to have anything to do with the other elements - like its sister." This is so great!! I would love it! Well something interesting happened 3 weeks ago was my 2 year old flooded my house by deciding to pour herself a bath and leave the tub running while I was downstairs cooking... water poured onto all 3 floors. Something interesting: tonight I was surprised by a friend stopping by and giving me a spare sewing machine! Merry Christmas to me! Today my son,4, asked me "mom do I need a costume for christmas?" I'm sure he wanted me to say yes. :) Merry Christmas. I am hoping to finish orders with enough time to make my daughter a Christmas Hello Kitty blanket. Yesterday I did something never done b4 - spray basted a 60x60 kids quilt and finished quitting it 4 hours later. If I'd used w&n batting it would have been finished a bit sooner. I'm struggling with a challenge quilt. It bored me to tears yesterday. Hello Vicki! Holiday Greetings from Toronto Canada. -Why does Santa have three gardens? -So that he can "ho,ho,ho"
Thank you for entering me to win such a lovely giveaway! This is so fabulous! I will tell you about the tutorial that I have to have completed by tomorrow...oh...wait...I still don't know what I'll be featuring, so I guess I can't tell you much, but at least now you know I'm a VERY last minute kind of girl! HA! How Fun! I took the day off work today so that I could finish all my Christmas sewing! On the list, a gardening apron and a heat pack for my mom. A bag for my sister, a clutch for my sister in law and a pillows for my aunts! It's going to be a busy day! Thanks for the chance to win! What a cute little quilt! I'm working on some mini quilts for friends, but I need to get to the post office first! Thanks for the chance. Love the mini quilt - too cute! I'm working on this month...let's see, 7 custom orders I promised a good friends friends I would do back in August, my own Christmas handmade goodies for my family...I'll never make it. I have a feeling I'll be wrapping quilt tops and asking for them back so I can finish them in January! I keep meaning to make mug rugs, but always seem to grab other projects! That li'l quilt is so cute! My daughter made us laugh at lunch today because she said her noodles were "too noodley." I guess I can't argue with that! I'm working on a baby quilt with cheetah and zebra prints! It's giving me a headache. I hope the receiver enjoys it more than I have! Wow, red elastic. I thought it only came in white. I must live in a small, small world. I am making hair bows for a craft show and for my daughter. I'm just getting into full sewing mode here. Sewing innocent crush scarves for friends, gathered clutches, and little goodies for my baby girl! I'm crazy about using the iron-on transfer paper you can print from your home computer. I've used it to make cute little Christmas outfits for the kiddos this year. Thanks for the sweet give-away... these days I am busy keeping up with my 2 yr old who loves to climb on anything and everything.... can't turn my back for even a second! I love it all -- and who doesn't always need a zipper? :) I'm making...well I need to make a bunch but instead I'm entering giveaways and adding about a bazillion blogs (Including yours) to my reader!! What a cute little quilt! I have been embroidering some tee shirts for my grands. Christmas is so much fun having little ones around. We recently rode the Polar Express in Palestine, Tx, and they loved it! Well, so did I! Love all the trims - those could come in handy too! I'm looking forward to my damson gin for Christmas! I love the hand drawn outline look on the mini quilt! Thanks for doing a giveaway! My interesting comment is that I just finished my very first quilt and I'm giving it to my grandma for Christmas. And my almost 19 month old daughter calls Christmas trees "papadrees" or "papadas". Cracks me up! Happy Holidays! Thanks for the giveaway! I just finished my Christmas placemats last night! Thank goodness I finished before Christmas! Thank you for the giveaway and for including so many things! I love hot chocolate - every day of the year. My little girl says "Goooood girl, Daddy" Cute give away! I found out in the last week that my sister is getting married and my step-brother and his wife are expecting a baby! ACK! I can't handle all this before Christmas! Thanks for the giveway. Nice blog you have. I am making gnomes, gnomes and more gnomes....!! I'm a handquilter and recently I've been trying to teach myself how to freemotion machine quilt. A couple of weeks ago I finished my first quilt using a freemotion machine quilting technique. I was only doing a meandering stitch but the whole time I was quilting I kept hearing Obi-Wan Kanobi saying "Don't cross the stream Luke! Let the force be with you!" For christmas, I actually wasn't going to make anything until I started doing the sew mama sew giveaways. And then, suddenly, there are so many ideas. So as I type this, I'm working on homemade christmas ornaments. Go figure. Here is my comment: We are all at the mercy of the hand of God regarding all this white stuff that has most of the state of Ohio snow bound! Loving the Christmas rug! I'm taking a break from decorating Christmas cookies now. The sprinkles are so cute but frustrating. I have tree and snowflake sprinkles that have pieces missing and look just wrong so it is the longest process ever - when it should be so fast! Such a great giveaway. The mini quilt is really cute! Something I'm making is a stuffed monster for my son. Thanks for the chance to win. Hello ; and thanks for the chance to win ! I made 5 quilts for Christmas gifts for 5 special people ! And I have some mug rugs and 'tissue holders' to make .... This is my 1st year of quilting , so I've been having FUN !! I have seen so many cool blogs today with this Sew, Mama, Sew giveaway! Cool stuff! I am working on two quilts, 2 table runners and 2 Christmas wall hangings, well...I am supposed to be working on them! My son is making up riddles, lately. His latest, "Why did the cats mess with the rats?" The answer, "Because they were hungry!" Totally funny in a not funny sort of way. Good luck with your giveaway, I love your mug rug. The mini quilt is adorable! After looking at all the giveaways the one thing I really want to sew is a mini quilt or mug rug as some people call them. I don't have any kids but I do have two little dogs. The youngest can in from outside today and she loves to run and find me. She went flying past the room I was in and halfway past the door she put on the breaks. We have hardwood floors. So, what I saw was this dog running at top speed try to stop but slid right past the doorway. It made me laugh. That little quilt is adorable! The other night, my 3 year old and I were talking about Christmas trees, and how Curious George had fun going to get a tree. My son very proudly said, "we went to the garage to get our tree." It was so cute, because he clearly thought that was very exciting! And made me feel a bit better because I felt sad that we don't get a live tree. Let's see...a cool gift I got was my ipod touch last Christmas, I love being able to read my favorite blogs on it. My 2 year old daughter is a nut, it's easy to tell story after story about her..."interestingness". LOL. She likes to believe that she is a puppy these days, communicating with barks and growls that sound suspiciously like thinly veiled words. She carries a dog bed wherever she goes in case she needs to circle several times and take a nap. She will only let you brush her hair if you refer to it as fur, and likes it when you compliment her "pretty fur" (you can tell she likes it on account of the licking). She insists on wearing collars, whatever she finds she will try to wear as a collar. A piece of ribbon. A wristwatch. A piece of garland. One of the worst parts is when she brings her toy stethoscope to you and asks to go for a walk... she puts it around her neck and makes you hold the end. And you have to walk her like a dog. But at the pace of a wounded, blind snail. Yes, she is an interesting child. Imagination as big as anything. Thanks for the chance! Down here in Alabama missing the pretty colors of Fall in Virginia! I once saw a chicken cross the road...well, actually, it flew. I was walking my dog down a Japaneses street (I lived there for a while) and we come up to a chicken that's just hanging out in the middle of the sidewalk. My dog goes up to sniff it, and it flies away, across the street, and lands on top of a city bus, that then drives away with the chicken on top. A japanese lady then comes out and asks me in perfect english "Was that your chicken?" Hey Vicki, are you ready for Christmas? So one of the first dates with my husband we were fishing and he gallantly offered me the front seat in the small boat rather than the bench seat in the back. Still withing view of his parents house, the seat I was on came loose, I went feet over behind, lost my rod and reel in the bottom of the lake and made such an interesting first impression on his parents!! I think your Christmas mini quilt is just adorable. I haven't gotten the courage yet to draw with my stitches in quilting yet but I really admire others who do. I nosed around your blog a minute just now and realize I had been here before. I found your chicken tutorial when I was in search of a pattern for a quilt block exchange. thanks for sharing your work! I adore this mini quilt! My favorite elements are the blue plaid present and the little section of binding that looks like ribbon candy. My favorite candies ever (I'm a sugar-holic) are ribbon candy and filled raspberries. I can never seem to find either since moving from the Atlanta area to southern New Jersey. I was doing a major happy dance a few weeks ago when I saw filled raspberry candies at the Amish market in their bulk section!!! I bought a big bag, lol! At the moment I am trying to finish a quilt for my son. It is a disappearing 9 patch, started it in the middle of the year. It was going to be a Xmas present but it isn't anywhere near finished. I am putting the binding on the last of six Christmas table runners tomorrow morning. After that, I will be putting the binding on a lap quilt I finished last summer, but am just getting to now. After that, I am debating between starting a baby quilt that is two months late and an applique project or two. My Christmas list is almost complete. The kids and I will be making soap, playdough and cookies then we're all done! 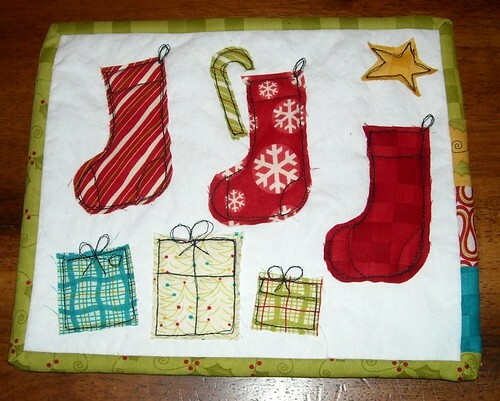 That Christmas mini quilt is adorable! my children are heading for coal in their stockings i tell you. i love christmas time but it really does make everyone a tiny bit crazy. That wall hanging is darling. I love how you added bows to the packages. I am working on table runners for Christmas gifts. Alright, well, it's WAY too late to even get started on a project but your little quilt made me want to start making a little mug rug for a friend of mine. Something about seeing yours made me think of her. It's true what they say about third babies being easy. I thought this was pretty funny: I told my little granddaughter the other day, "I love you!" Her reply: "You wear me out!" I am busy making a peg pinny and some car playmats for christmas. Lovely giveaway. Love the mini quilt. I've been trying to make sure I do at least one crafty type project a month. I love looking through blogs like yours for inspiration! I'm making a baby quilt at the moment, a stacked coins quilt with lovely bright fabric! Hi, I'm Mary. I have a brother named Jesus. Jofus lives with the sheep. beautiful prize. How hard is it to think of something interesting to tell you? I'll tell you about one of my rabbits - Colin. He's a bit moody at times and goes off in a grump where he sits in a corner and glares at you. Other times he wants to be patted and stroked and fussed, but sometimes he just likes to glare! My daughter is a kindergarten teacher, one student said to her last week "did you know that I was born on my birthday"? It was her kindergarten quip of the day. Gotta love 'em - sweet, innocent kids. Sneaking in a little white on red felt cross stitch deer while at work today. others take smoking breaks, why not a stitch break? To become an ornament or pillow???? Love the mini quilt. Would be perfect for the little elf I'm hoping will show up in my life right now to help me finish up all of the Christmas goodness going on in the house! Right now I'm working on a baby quilt, classic Winnie the Pooh fabrics. Thanks for the giveaway! We are recovering from a major rain/wind storm in Nova Scotia. Thankfully, we have power and no damage but others around the province weren't so lucky. Trees down, roads closed and schools and businesses closed. Hmmm...what can I tell you... I'm really a knitter but secretly want to learn how to sew. I'm hoping for a sewing machine for Christmas so I can learn. I don't have any good jokes, but I will tell you my youngest who is 2 just move around hers and her sisters beds and made a huge mess during "nap time"
Right now I am trying to finish an afghan for my youngest daughter, who just moved away to El Paso. You would have to know that is 17 hours away from me, and she is the only one of four children that has ever moved away. My heart cries over it often. I am also making a cool mod podged box for her that contains 4x6 mod podged cards covered with scraps of cool fabric, magazine cut outs and inspirational messages. After, I finish several cards I will mail her the box with the cards and then I can make a new card to add to the box from time to time. It is a lovely way to send her a uplifting message or word of advise. She can also keep them forever in her little wooden box. I love your mini quilt. Thanks for sharing. Great little quilt! Right now my 6 month old son is babbling away and cracking me up with all is crazy sounds. It's making my day! Great giveaway! I'm screen printing lots of gifts this year, it's my new favorite thing to do craft wise. :) I love the notions and mini quilt you're giving away! Love the quilt!!! My birthday is Dec. 17th, so winning would make the day even better! How about a good quote that will make you think? What a generous giveaway - thank you! I'm looking forward to being home this Thursday for my 21st birthday (on the 17th!) and Christmas - I'm still taking college finals. I also can't wait to get back to my sewing machine! this is a really cute mini quilt!! i have made a few christmas ones in years past and hang them each year or try to. I love that mini quilt! Such talent to be able to make it! Right now, bu bum is sore from sitting here all morning reading blogs and my eyes are bleery (is that a word? LOL!) from staring at the screen, but I am enjoying visiting the blogs immensely! (Sorry if that was TMI!) Thanks for the chance to win! I am making a quilt for my nephew, all full of cars! I love your notions giveaway. I always seem to be looking for that one special zipper to finish a project. Thank you. You should take a break from all this reading and have a cup of cocoa ;) and thanks for the chance to win. I'm not very witty, so I'm just going to say thanks for the giveaway - I'm laying in bed, waiting for my baby to arrive. Literally. I'm due anytime between now and Christmas, so I have some time to browse your blog! Thanks for the inspiration - I like the idea of a mini-quilt (since even thinking of making the big ones totally overwhelms me)! I'm making my niece a quilt. I just made a set of placemats for my parents with my children's handprints on them. I think they will love them. So I told him that papa will be very happy with this, and added that he can now reserve the word "prei" for the vegetable alone. And then he said something that loosely translates as "yes, but papa will always be my veggie no less..."
So cute. Thanks for the chance to win the caring stocking quilt and the fun notions bundle. I am very excited tonight because tomorrow I fly out to my in-laws' house for the holidays. Hooray! They haven't seen my boy since he was a newborn, and we, in turn, get to meet other nieces we've never met. Hooray for the holidays! I am making an apron right now for one of my blog friends. I am hoping to finish it in time for Christmas too. Something funny, my son turned 3 in August. He has always been very picky about things he touches and now we call him nose picky because he can't seem to keep his fingers out of his nose lol. I am busy sewing stocking stuffers and aprons. Yikes, some days I seem to get so little accomplished. There are 4 potatoes sitting in a room. Which one is the prostitute? It's the one wearing a sticker that reads I-DA-HO! For my birthday I bought myself a pair of sterling silver recycled earrings and they are the best ever... Great giveaway!! My daughter had just got done making cupcakes for her 3 year olds birthday. She went outside for a few minutes and Jada stole one of cupcakes, went in on her bed to eat it and made a big mess. How cute is that little quilt? Pretty darn cute. When Chuck Norris falls into the water, he doesn't get wet. Water gets Chuck Norris. Love your give aways!I am currently working on a Scappy quilt. Thanks for the giveaway and happy holidays. I've got a few mini quilts to finish - feel like I committed myself to too much! I dropped our lunch on the floor after I burnt myself today. Thought you might like to hear something different. I'm making a cushion for my mother in law with her wedding pic from 60 years ago on it (printed out on fabric) and embellished with lots of lace. 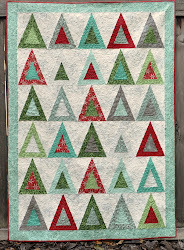 That christmas mini-quilt is the coolest, so funky! The other day, my family and I were out having lunch at a restaurant with my 10 month old daughter. She was happily sitting in her high chair, eating pears, when the waiter came by. While he was taking our order, she reached over and put her hand in his pocket! It was hilarious. Cute giveaway! Love the applique. The little red eyelet tape thingy is so cute!perfect for embelishing boy clothes. Loved visiting your blog - your items are beautiful. Something funny to share - my daughter just said she was "drinky" - I guess that is the new word for "thirsty". Thanks for the chance to win! Hi, that's a cute quilt! I am making some wristlets and pouches for Christmas. Next year, I hope to finally start on a quilt :) Happy holidays. This year is the first time I will be going home to new orleans for the holidays so this year my crafts are all New Orleans Saints Football themed! Turned out to be very easy and I am almost done! Thanks for such a wonderful giveaway! I woudl be so proud to have it! I had someone send me a joke for my giveaway: Why don't seagulls fly over the bay? Because they'd be bagels! (hahahah). Okay, silly joke, but still. Not too interesting, but I'm learning to sew and I'm making cute purses and wallets for my mom and my sisters for Christmas this year. I'd better get busy because I haven't started yet!! I'm making a shawl that seems to be taking for ever. It is a cursed shawl and I can't wait for it to be finished, but that may never happen. I am the Sisyphus of shawls. Oh! The stockings are so cute! I'd love to win! My Christmas gift for this year will be the birth of my second boy :) Very special holidays this year for us! The mini quilt is so cute! Love the mini quilt and notions. The most cool thing that happened to me lately is ... all our oldie goldie sewing machines broke ... sewing withdrawal set in .. we traveled to the nearest large city ... and my mother bought us a new sewing machine that is loaded with features. Thanks for the giveaway. Something cute the kid did? We let the 18 month old blow out the advent candles - and now he blows at candles all the time even when they are not lit - and laughs! My grandson had an ER visit last night. He enjoyed getting a Christmas gift from the staff though he couldn't remember what it was. What he really liked and brought to nursery school with him this morning was the skin stapler they had used to staple his head wound! Funny fellow, and a joy to me. Love your mini wall hanging, free motion is a hard task to master but we must do it! I am working on a Chinese Coins Christmas quilt, really should chop chop rather than sit here on the computer all morning! Thanks for the give away, I am a follower. Love your giveaway! We will be leaving Friday to go to FL to visit 3 daughters, 3 grand kids and one son-in-law. It's going to be fun! My son uses his bottom drawer as a step stool. He pulls it open and steps into it and reaches what he wants. He can't understand why the drawer won't close. My husband says my son's dresser drawer needs new rail tracks-imagine that!!! They will bring you down to their level and beat you with experience. What a fun giveaway! I am working on last minute gifts and trying to figure out what to get my brother's girlfriend! Well, the cat just knocked over the Christmas tree, that was pretty funny! thanks for your terrific giveaway!! Interesting Hmmmmmmmmmmm. My grandson was born with two teeth in his mouth. Is that interesting -- it was to us. Today is my m-i-l's birthday and yesterday we celebrated my son's b-day, who just so happen to have been born on his dad's(my hubby) b-day, who is has an identical twin, and the twins were born on their dad's b-day....3 generations share the same birthday...we make sure to save room for cake, because there's a lot of it!! Do you know, that it is pretty hard to write an exciting commend in a foreign language? I could tell you a German joke but you won't get it right probably. My kids used to make faults when speaking and know I'm wrighting them down in a little booklet to share them later. They are all grown up know but still making funny mistakes I can write in this book. Sometimes we read from the booklet aloud and laugh all the time. how unique that little quilt. I made a little apron for our 18 month old grand daughter to play kitchen in. I took a terry cloth Christmas towel ( snowmen on it), cut it in half, pulled a length of binding out of my binding basket ( where I throw leftover binding from quilts), added it to the top and wah lah a toddler's apron. Well, made two since I cut the towel in half. I went to a yankee swap "handmade" last evening, great fun for crafters! !Give something your made and get some little ditty someone else made! Thank you!! Very cute mini quilt! Thanks for the giveaway! I read the "Cookie Rules" over on Carrie Nelson's blog yesterday and if you want a chuckle go over there and read them. VERY funny!! My two year old is into Christmas carols right now. My favorite is her rendition of "Krosty the Snowman". Priceless. My friend gave me a kindle. Now that was a shocking surprise. Okay, what to tell ... Firstly, I LOVE that mini-quilt! What cute applique! Something funny the kids have done...well it's not so much funny, but I discovered it yesterday! We have foam covered poles around the tramp holding up the net and they've been chewing on it like mice. I saw my almost 4 year old chewing something and she said 'it's blackberries' and I freaked out thinking it was some random poisonous berry in the garden...but it was foam. Charming. I found a recipe the other day for a Caramel Christmas Fruit Cake, so am planning on making this at the weekend if I can track down some treacle. Living in a place where it is a mission to find, and fruit cake isn't traditional. So, it will be a treat for the family and friends who will be staying with us. I am addicted to Christmas crafty itmes, your quilt is wonderful. my husband came home from work one night & my 3yr. old told him he smells like an orphan! Love the little quilt! This is my 6mo old son's first Christmas. Waiting for all the fun! hhahhhhhaaha got laugh at my own foolishness! Hmm interesting hey... I get scared to cut into my fabric, it's all sitting there nice and pretty and then I get scared that I will cut the wrong pattern out and it will look ugly or that I will just plain mess it up.. silly I know. My favorite gift this year is the window my friend's husband put in for me as a gift since I did not have the funds to get it fixed. It brought me true joy. Wow, that's a lot of pressure to perform! I'm making my adult children their Christmas ornaments. This year they are stuffed felt characters (snow people, monkey.) I still have to stick their arms and legs in and do a little finishing. Hope I make it! Just what I love a pile of items. Make something out of them. It makes the creative juices flow. I have been making totes this week for Christmas gifts. Wish I had started in June. Never again. Look on www.cedarridgestudio.blogspot.com if yo are interested. Ok, here is the cheesy joke of the day. Feel free to tell it to the relative that is annoying you the most...ya ready? I warned you it was cheesy! Thank you for participating in the giveaway, especially when time is at such a premium. i've been working on a quilt for my teen son using old denim jeans. Still scrambling over here to finish some stuffed monkeys for my kids. BREATHE! Merry Christmas! I'm spending Christmas Eve at my mom's house. She has to work, but we are going to celebrate afterward. I called her tonight and offered to cook a turkery dinner at her house! Thanks for the giveaway! Cute mini quilt! One thing I'm making this month is a knitted cupcake hat for my niece.